This article is about the card. For the character, see Laaneth (character). Summon: Draw a card of your choice from your deck. Laaneth is a unique legendary Intelligence creature card. It is part of the Clockwork City story set. A playset of the card is awarded for completing Enter the City. The premium version can only be obtained by soul-summoning, which is only possible after the completion of Enter the City. "I sense great power in you." "What secrets do you seek?" "I don't know it all, but I'm pretty close." Laaneth first appeared in The Forgotten Hero and later in Return to Clockwork City. 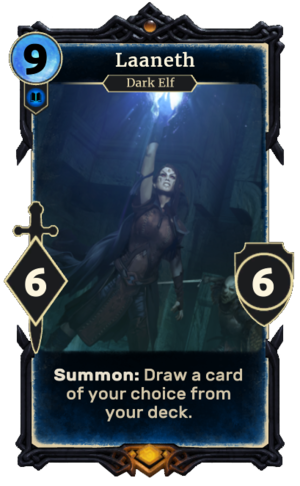 An alternate-art version of the card was given to those who pre-purchased the Return to Clockwork City Triple Bundle. This page was last modified on 11 March 2019, at 17:33.